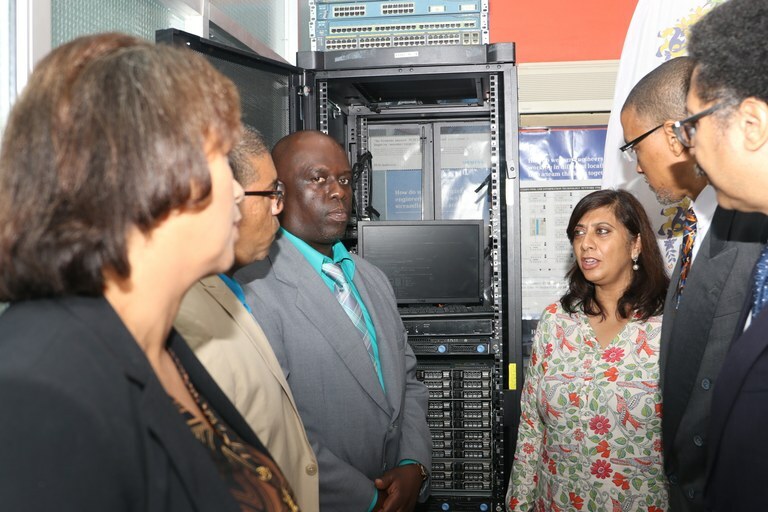 UTech Jamaica and UWI, Mona Receive $12M Computer Network Equipment from Palisadoes Foundation — UTech, Ja. Professor Stephen Vasciannie, CD (4th left), President, University of Technology, Jamaica and Mr. Peter Harrison (3rd left), President, The Palisadoes Foundation shake hands following the official handing over of network equipment valued at $12M by The Palisadoes Foundation to UTech, Jamaica and the University of the West Indies (UWI), Mona campus at an official handing over ceremony held Friday, January 19, 2018 at the UTech, Ja. Papine campus. Participating in the presentation (from left) are Dr. Sean Thorpe, Head, School of Computing and Information Technology, UTech, Prof. Nizla Aples, Dean, Faculty of Engineering and Computing, UTech, Dr. Gunjan Mansingh, Head, Department of Computing, Faculty of Science and Technology, UWI, Mona and Mr. Sheldon Powe, President, Jamaica Computer Society. 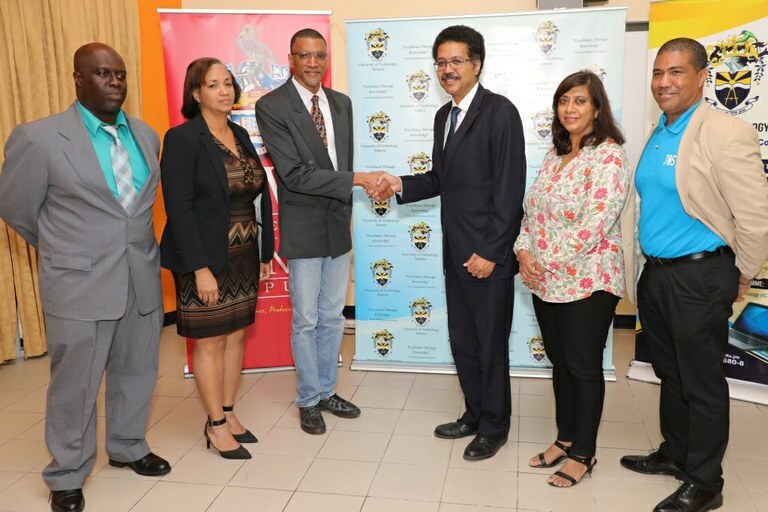 The University of Technology, Jamaica (UTech, Jamaica) and the University of the West Indies (Mona) campus today, Friday, January 19, received a donation of computer network equipment valued at over $12M from the USA based Palisadoes Foundation (LLC). The Palisadoes Foundation is a registered company in the state of California, USA, established by ICT professionals in the Jamaica Diaspora’s Technology Taskforce to promote the use and production of ICT services in Jamaica. 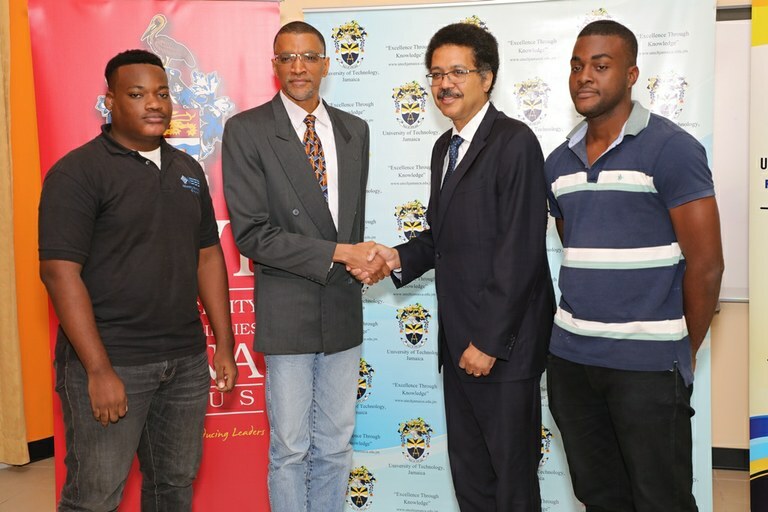 Professor Stephen Vasciannie, CD, (2nd right), President, University of Technology, Jamaica and Mr. Peter Harrison (2nd left), President, The Palisadoes Foundation shake hands following the donation of network equipment worth $12M dollars to UTech, Jamaica and UWI, Mona. Sharing in the presentation from left are students Mr. Agyei Masters, School of Computing and Information Technology, UTech, Jamaica and and Mr. Mathew Stone, UWI graduate student.